SQI Certified UI/UX Developers create and implement software code in order to improve the effectiveness of a website. With the ever-increasing demand for website designers and a top-notch experience worldwide, acquiring this skill is a timely one. We’ll introduce you to the art of making beautiful web apps. We’ll explore key UI and UX concepts that are essential to building good looking and easy to use apps that are loved by users. We’ll teach you how to face a professional design project for Web Application from the beginning. Along the way, you’ll learn how to develop applications that better integrate user interface and user experience and are easier to interact with, less prone to error, and ultimately more likely to generate satisfied users. SQI Certified Front-End Developers are responsible for implementing visual elements that users see and interact with in a web application. They are usually supported by back-end web developers, who are responsible for server-side application logic and integration of the work front–end developers do. We’ll teach you how to implement responsive web design principles to ensure that our company website renders well across multiple devices, design a framework for creating user apps that grow with the needs of the company, monitor website performance, watch for traffic drops related to site usability problems and rectify the issues amongst others. 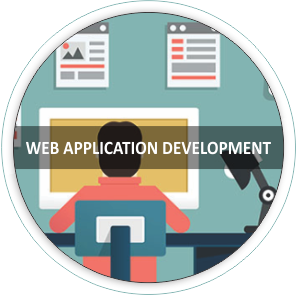 We’ll teach you how to develop a web application from start to finish independently without any external input. SQI Certified Master Full-Stack Developers are able to work in any environment. The ability to code in any stack gives them this unfair advantage. We’ll teach you how to code in different stacks, initiate and complete software projects on your own and do much more than just writing codes.